Prime Minister Justin Trudeau must listen to his father. "There are a lot of bleeding hearts around who just don't like to see people with helmets and guns," Prime Minister Pierre Elliott Trudeau said when Canada was terrorized by the FLQ crisis 45 years ago. "All I can say is, go on and bleed, but it is more important to keep law and order in this society than to be worried about weak-kneed people who don't like the looks of a soldier's helmet." Faced in 1970 with terrorists bent on using bombings, kidnappings and murder to achieve their aims, Canada’s prime minister was not afraid to order soldiers into the streets of Montreal, or do what was necessary. He was not afraid to do what was just. “I think the society must take every means at its disposal to defend itself against the emergence of a parallel power which defies the elected power in this country, and I think that goes to any distance. So long as there is a power in here which is challenging the elected representative of the people, I think that power must be stopped and I think it's only, I repeat, weak-kneed bleeding hearts who are afraid to take these measures,” he said to justify using the War Measures Act against Quebec terrorists. Today, Trudeau fils faces a new totalitarian threat: rogue ideologues are indiscriminately killing people in the world’s great cities. They have have made a public spectacle of murder by beheading and immolation. They have bombed airliners. They have murdered people enjoying themselves in nightclubs and sports stadiums. What happened Friday in Paris was indisputably a crime—indeed a double crime—against humanity. So is what happened only a few days earlier to the Russian airliner over Egypt, or what has happened in Mumbai or Australia, or even in Ottawa. The first crime is the taking of innocent life. The second is the terrorizing of those fortunate enough to have avoided death so far. Hardened radicals, bent on wanton destruction of human life, have attacked citizens in the name of an evil movement. It is a movement with a name—ISIS—though its face is routinely covered with a coward’s mask. It has even proclaimed a capital city, Raqqa, in Syria. Its foot soldiers are the suicidal pawns of an illegitimate regime with a stated goal of destroying western civilization. Driven by a mad ideological impulse, ISIS has attacked, with impunity, powerful countries bearing proud military histories. Countries that suffered through, and prevailed in, the Battle of Stalingrad and the Battle of Britain have seen their citizens attacked. So has France, which endured occupation by Nazi Germany. Canadians, whose national pride is founded in the story of Vimy Ridge, have been threatened. Countries bound together in NATO, countries with nuclear weapons at their disposal, have been left battered and blood stained. Did those behind this movement not know with whom they were dealing? Or, much worse, did they know exactly with whom they were dealing? Could they count confidently on being able to hit and run without fear of serious reprisal because they knew the political leaders of the target countries have become, in Pierre Trudeau’s words, “bleeding hearts who don’t like the sight of people with helmets and guns”? How else could they trample with bloody-minded glee on countries with such proud military traditions? Only three generations ago, after all our nations banded together to defeat an equally evil yet far more formidable foe. Only the loss of the stomach to do what is necessary or just can explain our current continual appeasement of our new enemy. Only falling into the trap of forgetting the distinction between doing what is necessary as opposed to what is acceptable. Our ancestors knew instinctively that the mediating factor between necessary and acceptable is justice. In justice, we do what is necessary even though it may not always be acceptable to our sensitivities. This is not a debate about left versus right. There is no time for partisanship when great and free nations are threatened. When history remembers a Roosevelt, a Churchill, a Truman, or a Mackenzie King, it is not to praise one for being a Democrat, another for being a Conservative. What is valued is strength in leadership, and the fortitude to make difficult right decisions. Civilian casualties are never acceptable. Not in Paris or in Mumbai or in Ottawa or, for that matter, in Raqqa, Syria. But seeking what is just shifts the conversation from the acceptable to the necessary. The destruction of Nazi evil, for example, required total war. It required invasion, bombing, and destruction of cities to cripple the capacity of Germany to continue its crimes against humanity. It was an awful price to pay. By any equation, the loss of a single human life is tragic and unacceptable. But in the course of human history, we know there are moments when it is necessary. Because it is 2015, Canada has endured more than its share of such moments. We have a long history of siding with justice. When necessary, our great and free nation has been asked to do the difficult, even the seemingly impossible. We climbed the hill at Vimy. We fought on the beaches of Dieppe and Normandy, and in Italy and Holland. We stood against tyrants in Korea. We positioned ourselves between bitter enemies in Cypress and in the former Yugoslavia. And, yes, we took up arms against the Taliban. 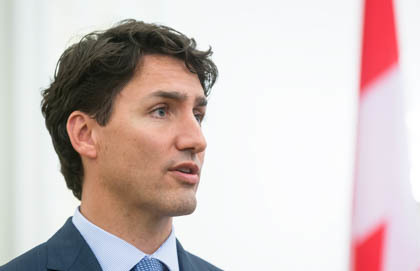 Justin Trudeau, not yet a month in office as 2015 comes to an end, is being called upon to act in difficult times. He must be encouraged to remember the history of the great nation he now leads. He must be implored to listen to the words of his father. Like his father, he must do what is necessary and just. Our first Prime Minister Trudeau placed himself on the right side of history for Canada. Our second Prime Minister Trudeau must do likewise.